Etisalat Network use to have the cheapest data plans but suddenly made a U turn and become the network with one of the most expensive data plans and unsurprisingly the lowest number of subscribers among the top 4 telcos. Now Etisalat has a new plan which actually gives you up to 1gb for just N200 valid for 3days. The new plan is arguably the cheapest you can get from Etisalat and it works on all internet enabled devices. Activating this plan is very easy and straightforward. #1. 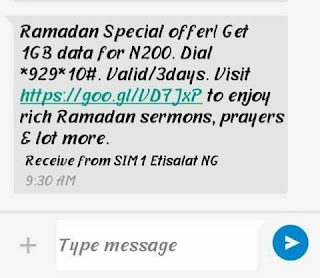 Make use you have at upto N200 on your Etisalat SIM. #2 Dial *929*10# and you should get a confirmation message. NOTE: In case you get an arror message while trying to activate the plan, Just call the customer care ( 200 ) and tell them to help you activate the Special 1GB for N200 Etisalat data plan. This is not a cheat so they will definitely activate it for you. If you have any question, feel free to ask. Tell us if it works for you.